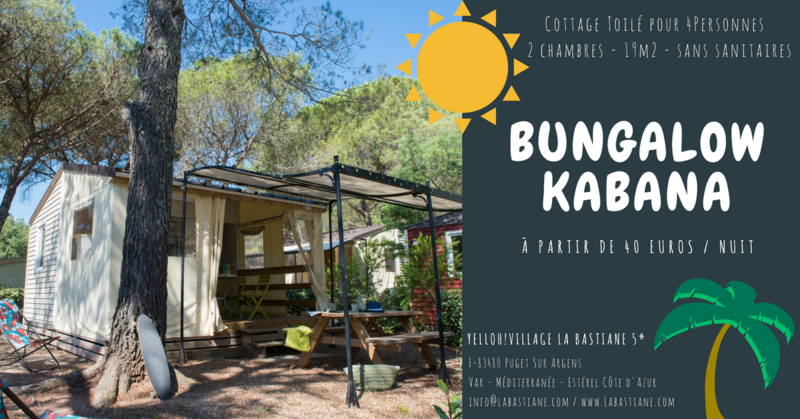 If you are looking for a rental for outdoor holiday, the cottage canvas KABANA 4P is made for you! With his rather relaxed style and his camping spirit, he offers comfort and freedom to all his occupants. Designed for families, it includes 2 independent bedrooms, a single-storey canopy awning and an equipped kitchen area (fridge-freezer, microwave, hob and complete inventory for 4 people). This bungalow without toilets will perfectly meet the expectations of holidaymakers in search of nature and authenticity. Cottage canvas KABANA only available from June 16th till September 08th. Arrivals & Departures 7/7 – Stay of 2 nuits minimum, from 40€ per night. In summer, A/D on Wednesday, Saturday, Sunday. Stay of 7 nights minimum, from 420€ the week. Formula Weekend 2 nights (Friday-Sunday or Saturday-Monday) from 99€.